Samsung SP-A600B review | What Hi-Fi? Samsung? Making a projector? 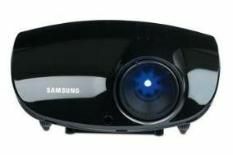 Actually it's not as unlikely as you might think: the Korean giant has quite a record with business-orientated projectors, particularly those manbag-friendly miniature designs so beloved of sales types. The SP-A600B is aimed at home cinema enthusiasts, its 1920 x 1080 DLP chipset and six-segment colour wheel promising much in a class dominated by LCD projectors, and it's elegantly turned out, too, all sultry curves and lustrous black lacquer. Even its on-screen menus display an elegance that eludes many rivals, with a simple structure any Samsung TV owner will recognise. Such approachability makes the SP-A600B easy to live with: the only downside is that it lacks the vertical lens-shift system found in many competitors. You'll have to faff around with the supporting feet to place the image where you'd like it, which could get irksome if you're planning to use the Samsung only occasionally. For a permanent installation, however, it's not an issue. In use, the '600B is admirably quiet. It's also able to deliver a great picture. Fed with Blu-ray, colours are terrific, the Samsung thriving with both the muted palette of The Hurt Locker's desert sequences and the more dramatic hues of Pixar's wondrous Up. Black levels and contrast are fine too, at least for the price. Some visible noise is apparent on most transfers, especially in darker scenes, and even with the noise reduction mode switched on, it's never entirely eliminated. And, with HDTV, some motion can seem less smooth than we'd like. Otherwise there's much to admire here.